We arrived in the early afternoon and set about finding a hotel for the coming night. It was going to be a flying visit, a single ascent of Alpe d’Huez followed by a refreshing shower and some dinner. The village of Bourg d’Oisans lies at the foot of the legendary alp and after a quick walk around town we settled on the Hotel Des Alpes on the main pedestrianised street. The hotel looks to be in the process of a renovation, the deluxe rooms being nicely finished but the rest of the hotel and standard rooms looking a little unloved and out dated (the owners are friendly and a room is provided for bike storage in the basement). There wasn’t time for lunch so I stuffed down an energy bar whilst assembling my bike in the car park, and prepared to see what all the fuss is about this “legendary alp”. First impressions were that it looked pretty unspectacular, you can see the ski resort from the valley roads and it didn’t look all that far away. The statistics also didn’t sound that bad: 1118m elevation gain, from 742m to 1860m and an average gradient of 8.1%. That all sounded quite acceptable when reading it on paper, so just what made this worthy of the Hors catégorie status? After all it’s far from the longest or the highest climb in the area. I set off riding along the flat roads out of the village, over the roundabout and on towards the climb, keeping a good pace in a high gear. I expected to see the climb winding up the mountain ahead of me as I got closer but it just turns right and kicks up, steeply! I tried to keep my pace and the big gear tuning but before the first hairpin (numbered 21). I was in the small chain ring by now and heading rapidly for my lowest gear as my legs told me to slow down before it got too much. What a beginning, it’s just steep and relentless. The first 2km are over 10% gradient and the only little bit of respite is in the hairpins where you get a few seconds as the corner flattens out the gradient before kicking sharply up again. It’s just enough to let your legs spin up to a comfortable cadence before wishing you had fitted some lower gearing again as the gradient returns a couple of seconds later (I ran a standard 12-25 cassette and 39/52 front chainrings). Every hairpin counts you down closer to the summit, from 21 down to the finish line. The only distraction is the sweat running into your eyes and the paint on the roads. 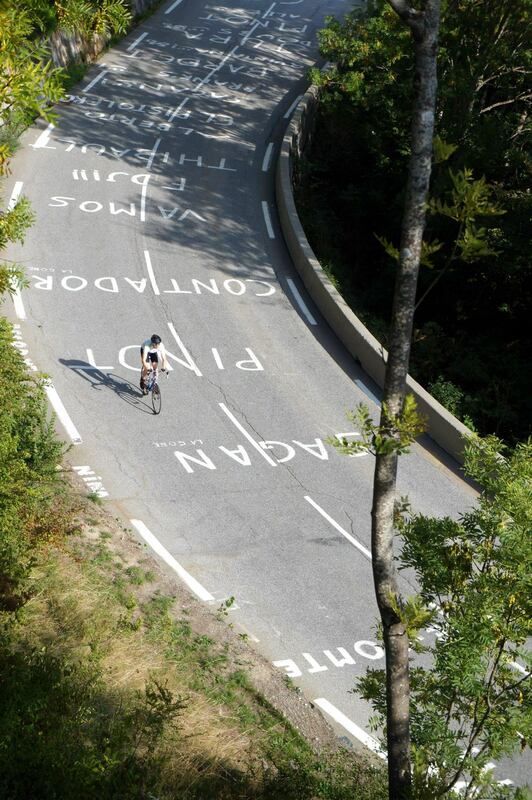 The Tour used Alp d’Huez as the final summit finish just a few months before my visit, so the graffiti looked fresh and the rider’s names oh so familiar. This was it, I was really here, I was sweating and breathing hard, riding over this same tarmac; even without the crowds you can sense the atmosphere that must have been here just a few months previous. Some graffiti on the low concrete barrier invites me to try and beat Marco Pantani’s ascent time of 36 minutes 40 seconds set in 1995. I think that’s very unlikely, at that moment I’d be happy just to make it up, I’m just trying to survive this relentless gradient. After hairpin number 10 I know I’m nearly half way and it feels like I can start counting them down as they enter single figures. After hairpin number 4 the road becomes exposed to a head wind and I really start to loose rhythm. It’s not a strong wind but combined with the gradient and fatigue it’s enough to noticeably slow me, I’m out of the saddle and bouncing weakly on the slow moving pedals, but my legs seem to be giving way. I follow the wooden signs with the yellow cyclist marking the route the Tour de France takes. A photographer takes some shots of my contorted face and sweat filled eyes and stuffs a card in my hand. The next hairpin changes my direction away from the wind, but I feel no benefit from it. I can see the buildings of the ski resort just above me, I’m so close, just 2 more hair pins to go. Another photographer runs out in front of me, this time I’m ready and I try my best to smile through the grimace on my face. One more to go and then summit, well actually it’s not over yet. The tour de France finish is another couple of km up the mountain but there is a summit placed conveniently next to a café with a large collection of cyclists congratulating each other over a coffee. I press on, following the yellow cyclist on the signs as the road winds to the right under a bridge, and what’s this? Another hairpin bend? The 22nd hairpin but the yellow cyclist signs tell me I’m on the right track. It flattens off now as I get back into the big chainring, over a roundabout and across the flat road in the centre of the resort. I brake sharply for the tight right hand bend on the final roundabout (not wanting to go the wrong way round when the roads are open). I can see the finish up ahead, across the car park. I’m out of the saddle sprinting, it’s up hill but it’s not too steep to keep accelerating towards the finish line where the relief of stopping will be all the better the sooner it arrives. The line is crossed, the pedaling stops and I quickly roll to a halt at the side of the road. Did I break any records? Absolutely not. Would I do it again? I’m in no rush to put myself through that particular climb again, but maybe one day, after some others. Will I watch with more interest and insight next time the Tour de France ascends Alp d’Huez? Absolutely. As far as scenery goes it’s fairly unspectacular, it’s not remote, there’s no glacier on the top and the ski resort on the top is fairly unremarkable. The finish line being in a large car park does nothing to add to this. The attraction of this particular climb is the history, the images on TV of Dutch corner, and the quotes like: “Of all the climbs in the Alps. Alpe d’Huez is the one I fear the most” Robert Millar KOM winner. So just what made this worthy of the Hors catégorie status? Quite simple, it’s hard, harder than the statistics suggest. The climb offers no opportunity for recovery, the sharp gradient at the beginning really puts you on the back foot before you can settle into a comfortable rhythm. Arriving here in the peloton fighting for position at the foot of the climb must really amplify the tiring effects of the steepest first 2km. The change from flat-out charge across the valley floor to tight corner and suddenly up must make being on the front at the base of the climb an essential position for the GC contenders. The pace chosen must then be sustained for what feels like the same gradient for the rest of the climb. There are no flat sections in the middle and no gentle rolling sections like many other passes. The gradient feels the same until near the top when it exposes to any wind, and then finally flattens in the town for the finish. To ride it feels like an achievement, to race on it really must really separate the true climbers from the rest of the field. To win on Alpe d’Huez, “the Hollywood climb” you instantly become a legend. Logistics: Grenoble airport is about an hours drive and bike rental is available in Bourg d’Oisans if you’re flying without them. Timing chips can be rented from the tourist office in the village and bikes can be rented from many of the village’s bike shops. Bourg d’Oisans lies in valley with immediate access to Alpe d’Huez and a flat valley road away from other popular climbs such as the Col du Glandon and Col de la Croix de Fer. These climbs lead into the next valley to such climbs as Col de la Madeleine. Bourg d’Oisans features many bike shops, bakeries, restaurants and a few hotels.